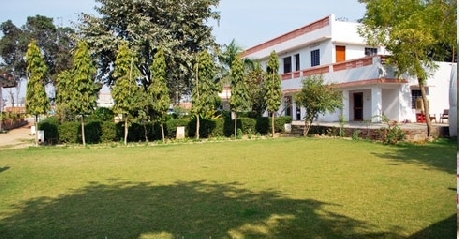 Situated just 300 meters away from the entrance of the famous Bharatpur Bird Sanctuary, Hotel Eagle’s Nest provides a great place of accommodation for the discerning guests on a budget. The best economy hotel in the vicinity, Hotel Eagle’s Nest provides a relaxing and comfortable environment in its well decorated rooms, lush green surroundings and on-site restaurant. The hotel has created a niche for itself in the hospitality industry for being a great budget hotel with warm and humble staff. The various arrangements of the travel desk and hotel reception for the guests including arrangement for boats, sightseeing and binoculars add convenience to the guests. These rooms are naturally air conditioned by the soft cool breeze flowing through the windows of the rooms from the lush green landscaped gardens. Providing a great view of the surroundings from the windows, these rooms offer a king sized bed with comfortable bedding a telephone with STD and direct dial services, an in-room safe, a color television with satellite channels and impeccable room services. The attached bathrooms with modern fittings are western in style and have 24 hrs of running hot and cold water. These rooms are fully air conditioned and provide respite to the tired adventure seekers and bird watchers. The rooms are decorated in European shades and offer all the modern amenities like a king sized bed with comfortable bedding, a telephone with direct dial services, a color television with satellite channels, a safe and an attached bathroom with running hot and cold water along with unprecedented room and laundry services. 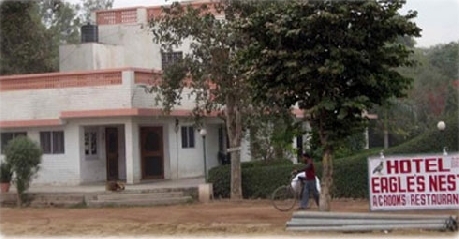 Hotel Eagle's Nest, Bharatpur, Bharatpur provides standard and deluxe single/ double bedrooms. Each room has been adequately decorated and furnished. The deluxe rooms are equipped with air - conditioners and standard rooms are equipped with air- coolers. Room facilities at Hotel Eagle's Nest, Bharatpur include Hot/ cold shower, attached bathrooms, 24hrs room service and lot more. The on-site restaurant offers multi cuisines dishes in tastes of Continental. Regional and Indian dishes. The chefs painstakingly prepare made to order dishes with fresh produce. The aromatic flavors and the exploding tastes of the spicy treats is sure to leave your taste buds wanting for more. The natural surroundings and the serene environment whet up the appetite after a fun filled day at the sanctuary and the restaurant offers respite with hearty meals that are scrumptious to taste and appealing to the senses.